There are currently seven "operating" research reactors in Canada: two at AECL's Chalk River Laboratories and five at universities. 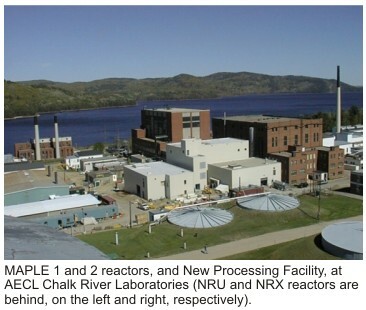 The Chalk River reactors are the 135 MWth NRU, and a zero-energy test reactor, ZED-2. The university reactors include five 20 kWth SLOWPOKE-2 reactors (at the University of Alberta (Edmonton), Saskatchewan Research Council (Saskatoon), Royal Military College (Kingston), and L'Ecole Polytechnique (Montreal)), and a 5 MWth MTR-type reactor at McMaster University. (A Canadian-supplied SLOWPOKE-2 is also operated at the International Centre for Environmental and Nuclear Sciences, Kingston, Jamaica, and three SLOWPOKE-2 units - the original prototype at the University of Toronto, a unit at MDS Nordion's facility in Kanata, and one at Dalhousie University (Halifax) - have been shut down). The SLOWPOKE-2 is a low-energy, pool-type research reactor designed by AECL. It uses passive cooling and safety systems, and is licensed to run unattended for short periods of time (e.g.. overnight). AECL also designed a scaled-up version (2-10 MWth) of SLOWPOKE for district heating. See related FAQ. 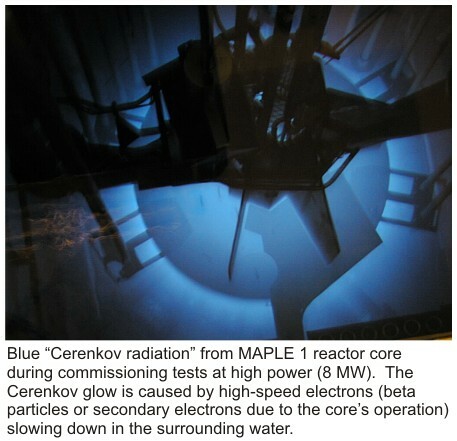 A more recent research-reactor technology developed by AECL was called MAPLE (see related FAQ). What are neutron "beams" used for? What is the Canadian Neutron Centre (CNC)? What is the SLOWPOKE reactor? One of the most common uses of a "research reactor" is to extract beams of neutrons from the fission process, and use them in both scientific and engineering applications in a laboratory adjacent to the reactor. As a research tool, the two main attractions of neutrons are their neutral charge, which allows them to penetrate dense objects, and their quantum wavelength, which is comparable to the lattice spacing in crystals. The combination allows the use neutron beams as a powerful "microscope", with which we can peer into an object without damaging it, measure the spacing of atoms, locate defects, and characterize the motion of atoms in their bound state. Neutron-beam materials research in Canada dates from the beginnings of its nuclear industry. AECL Chalk River Laboratories' NRX reactor, Canada's first research reactor (1947) was designed with many horizontal beam tubes radiating out into the surrounding experimental area. The same was true of NRU, commissioned alongside NRX in 1957 and still operating today. Dr. Bertram Brockhouse won the 1994 Nobel Prize in physics for his pioneering work in neutron-scattering, performed four decades earlier at Chalk River Laboratories. Dr. Brockhouse's legacy is alive today in many solid-state research programs at universities throughout Canada, and in the National Research Council's "Neutron Program for Materials Research", which operates the beam facilities located at AECL's Chalk River Laboratories. The NRC program is the "hub" of the Canadian neutron-scattering community, including research programs in Materials Science, Condensed-Matter Physics, Structural Chemistry, and Bioscience. In addition, the NRC's neutron-scattering program has engineering applications, embodied in its "Applied Neutron Diffraction for Industry" (ANDI) service. In this sense, the neutron beams become a powerful probe used analyze material failures, solve generic processing problems, perform benchmark calculations, and determine the efficacy of new industrial protocols or suppliers. MAPLE (Multipurpose Applied Physics Lattice Experiment) is a research-reactor technology developed by AECL, capable of fuels and materials testing, isotope production, and neutron experimentation (see related FAQ). The MAPLE concept features a 19.75% U235 enriched, H2O-cooled and D2O-reflected core, and operates with a thermal power of 5 to 40 MWth. It offers a high thermal neutron flux, small core volume, and accommodation for multiple beam-tubes and in-core experimental sites, as well as driven spectrum-specific facilities in the reflector (cold-neutron source, fast-neutron flux trap, etc.). 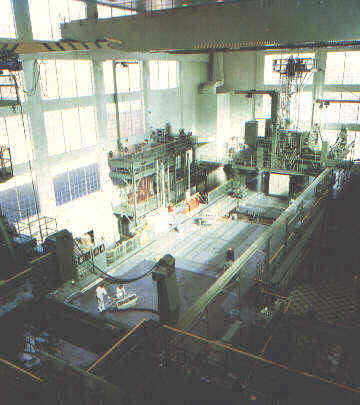 HANARO, South Korea's research reactor which reached first-critical on February 8, 1995, is based upon Canadian MAPLE reactor core technology (see the HANARO Web Site for more information). AECL constructed two 10 MWth MAPLE reactors at Chalk River Laboratories (see photos and diagram), which AECL had planned to own and operate on behalf of MDS Nordion, a global radiopharmaceutical supplier. MMIR-1 (or "MAPLE 1"), the first of these two new MAPLE medical isotope production reactors, was declared "critical" (began a self-sustaining chain reaction) at 2:53 a.m. on Saturday, February 19, 2000 at Chalk River Laboratories, becoming the world's first reactor of the new millenium. Achieving criticality is an important milestone on the road to full commissioning. (See also a related editorial by the author.) MMIR-2 ("MAPLE 2") achieved first criticality at 2:08 p.m. on October 9, 2003. The two reactors would have replaced most of the commercial isotope-production capability of AECL's NRU reactor. By 2008 commissioning excercises had taken the MAPLE 1 core to high power (8 MWth) and successfully tested many of the systems, including the safety shutdown system under conditions such as loss of power regulation. However, several first-of-a-kind technical issues significantly delayed the commissioning process, including regulatory concern over the power coefficient of the MAPLE core (discovered during commissioning to be small but positive). A series of tests were initiated to determine the cause of the positive power coefficient. On Friday, May 16, 2008, AECL announced that it had halted the development of the two MAPLE reactors at Chalk river Laboratories, citing future costs, risks, and changing market conditions beyond AECL's control. Instead, medical radioisotope production at AECL would continue for the forseeable future to utilize the NRU reactor at Chalk River Laboratories, and development resources would be focussed on both extending the life of that facility, and developing a mutually satisfactory plan with AECL's main medical radiosisotope custormer, MDS Nordion. 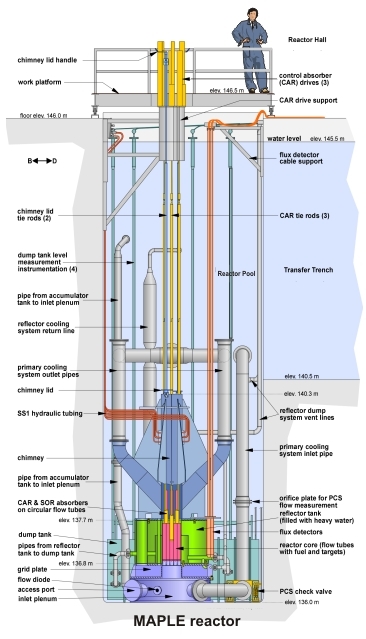 The Canadian Neutron Centre (CNC) is a proposed research reactor facility intended to meet Canada's long-term neutron-scattering and CANDU-development requirements, championed by the Canadian Institute for Neutron Scattering (CINS). The CNC, proposed as a replacement facility for AECL's NRU reactor (in operation at Chalk River Laboratories since 1957), is a reactor-based neutron source with associated laboratories and infrastructure. This world-class laboratory will surpass the NRU reactor in each of its primary functions, namely (1) the production of medical isotopes, (2) nuclear energy R&D, and (3) the production of neutrons for materials research. As an important aspect of Canada�s infrastructure for science and industry, the CNC will serve broad scientific, technological and health needs of Canadians for the coming decades. For more information, see the long-range planning document of the Canadian Institute for Neutron Scattering. The full plan lays out the requirements and priorities of the scientific community for Canada�s new neutron source from the perspective of materials research using neutron beams. This plan is the result of a consultative democratic process and is the culmination of the work of CINS members since the early 1990s. SLOWPOKE is an acronym for Safe Low-Power Kritical Experiment (the "K" is justified! -- it is the traditional symbol for "criticality" in the field of reactor physics). SLOWPOKE represents a low-power, compact-core reactor technology developed by AECL in the late 1960's. There are four SLOWPOKE-2 reactors operating in Canadian universities (see related FAQ), rated at 20 kW and supporting nuclear education and/or neutron research. The SLOWPOKE-2 core is only about 22 cm diameter by 22 cm high, and sits in a pool of regular ("light") water, 2.5 m diameter by 6 m deep, which provides cooling via natural convection. In addition to passive cooling, the reactor has a high degree of "inherent safety"; that is, it can regulate itself through passive, natural means, such as the chain reaction slowing down if the water heats up or forms bubbles. These characteristics are so dominant, in fact, that the SLOWPOKE-2 reactor is licensed to operate unattended overnight (but monitored remotely). In the early 1980's AECL developed a higher-power variant of this technology, called SLOWPOKE-3, which could act as a district heating source for remote communities. Such locations are often heated with networked hot-water systems that require a constant fossil-fuel supply. The SLOWPOKE-3 is similar in many ways to SLOWPOKE-2, but bigger. It operates in the range of 2-10 MW (100 times the power of SLOWPOKE-2), uses more fuel in a slightly larger core, sits in a deeper pool, and incorporates heat exchangers that remove the heat for external applications. Coolant circulation is still by natural convection in the pool, and the system was designed, like SLOWPOKE-2, to operate unattended for periods of time. The fuel in SLOWPOKE-3 consists of 5% enriched Zircaloy-clad UO-2 elements, and at 10 MW operation, needs to be replaced every three years. The economics of a district-heating system based on SLOWPOKE-3 technology were estimated to be competitive with that of conventional fossil fuels. Contributing to the favorable economics is the fact that transportation costs are reduced for fuelling purposes. The three-year refueling requirement of a SLOWPOKE-3 heating system is advantageous to remote communities, which currently rely on a continuous supply of fossil fuels (generally oil).